The Saga journal has long proven itself to be the journal of choice for Icelandic historians. It is issued twice a year and publishes peer-reviewed scholarly articles on a range of historical subjects. In addition, Saga is committed to covering recently published books and articles that relate to Icelandic history or academic research into Icelandic history. The subscribers of Saga are also members of the Sögufélag. The editors of Saga are Dr. Vilhelm Vilhelmsson and Kristín Svava Tómasdóttir. 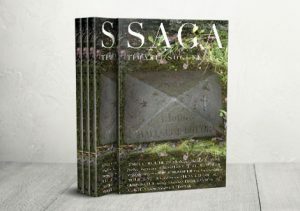 You can contact the editors of Saga by e-mails at vilhelmv@hi.is and kristinsvava@googlemail.com. The editors of Saga are assisted by a professional editorial team. The maximum length of peer-reviewed articles in Saga is 8–10 thousand words. The journal publishes three types of book reviews: a) detailed reviews where several works are compared at length, b) reviews on individual books and c) publication announcements which are intended to be a short introduction to important academic publications, such as collections of articles, conference papers, reference books, support material and translated works. Instructions for authors of detailed reviews, reviews and publication announcements. The Saga journal was first published in 1949. During its first few years, Saga was published in sheets, and several annual sheet issues were bound together into a single volume. This means that the labelled annual publications are much fewer than the actual number of years that the journal has been published. Saga has been published regularly since the 1970s in a single, high-quality volume each year. In 2002, Saga began to be published in two volumes each year, one in the spring and another in the autumn. At present, all older Saga publications are available on Tímarit.is. In addition to Saga, the Sögufélag has published two other journals: Blanda and Ný Saga. The founders of the Association understood that it was not sufficient to serve up the historical raw materials contained in the sources, but rather that the material had to be processed into a readable narrative for the public. The Association performed this interpretive role by publishing the paper Blanda in 1918–1953. The paper published essays and a diverse range of interesting source material and was quickly held in high regard. The entire publication of Blanda is accessible on Tímarit.is.